Professor Brian Cox is on a mission to turn one lucky UK school class into budding scientists and engineers as he launches his search for The Big Bang Class of 2013 - a national schools competition to win a science lesson of a lifetime. 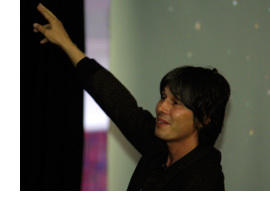 Win The Big Bang Lesson with Professor Brian Cox at your school! Be the stars of a lesson streamed live on TES! Professor Brian Cox is on a mission to turn one lucky UK school class into budding scientists and engineers as he launches his search for The Big Bang Class of 2013 – a national schools competition to win a science lesson of a lifetime. Back by demand from thousands of star-struck youngsters, the Professor has joined forces with The Big Bang UK Young Scientists and Engineers Fair once again to find a new class of willing young space cadets. School children, teachers and parents can now enter their class (or child's class) into the special prize draw, which will see the TV scientist rocketing into the winning school on 6 February 2013 and surprising pupils with an extraordinary science lesson. The lesson will be streamed live on TES to classrooms around the globe, so don't miss out on this fantastic opportunity to be the stars of a sensational world-wide event!